WARNING: This book is not new. In fact, it’s crazy old. My original copy is still sitting on my closest bookshelf. I have loved this book for over 35 years. Mr. Cohen’s style is straight-forward, engaging and sometimes funny. Cohen is from an era where the Cold War was in full swing. Some of his stories and illustrations prove the point, but the lessons taught are timeless. Fans of the TV show, The Americans, will appreciate Cohen’s historical perspective. For years this book was the one I gifted most. 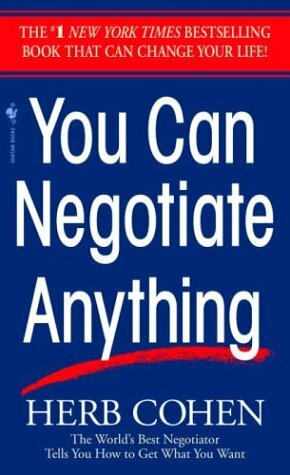 Who can’t use a good book on negotiation? It doesn’t matter if you’re buying a car, a house or trying to negotiate your way out of a lease – Cohen gives us real-world lessons. This is NOT a book written by a college professor. Rather, it’s written by a guy who has spent hours at a negotiating table. Cohen knows what it’s like to be in the middle of a labor dispute where politics, public opinion and self-interests seem to rule the day. He’s experienced the pressures of the deadline, as well as the lack of pressure where there seems to be no deadline. Cohen is no dummy though. The man studied Political Science and also earned a law degree. He’s spent some time on the faculty of some major universities along the way, too. But he’s not your stereotypical member of academia. He earned his negotiation chops the hard way. Whether it’s a labor union dispute or a political negotiation involving countries Cohen is a guy who is at home in any situation. This isn’t some touchy feel good tome. Nor is it a study of classroom experiments. It’s story after story with lessons taught all along the way. It’s the story of negotiating with the Soviet Union. And it’s the story of negotiating with others less stringent in their demands. Nobody was tougher than the Soviets who embraced the “my way or the highway” negotiation stance more than most. If you want to learn negotiating from somebody who has both studied it, practiced it and mastered it – then Cohen is your man. If you want high brow, deep thinking, philosophical or idealistic approaches – steer clear. Cohen is like your uncle who has mad skills at the real life situations that demand your very best. After all these years (the book was first published in 1980), the book is still one of my favorite books on the subject. And not just because the negotiation stuff, but the human nature or psychology stuff, too. After all, when we’re trying to get a deal done we’re working with and through other people. Besides all that, Cohen has great stories. Cohen wrote a followup book entitled, “Negotiate This! : By Caring, But Not T-H-A-T Much.” It’s a good book, too – but I still cling to the original. Don’t be put off by the date. People are people. Time doesn’t change us as much as we’d like to think. The things that affected people decades ago are still the things that affect us today. The hacks into human behavior are remarkably unchanged. When people ask me for a book recommendation on negotiation, this is still THE book I mention. Visit a used book store. Find a copy. Read it.